As the New Year approaches, it seems like every year is dubbed "a year like no other." But 2017 truly was more dramatic than many other years in recent memory. 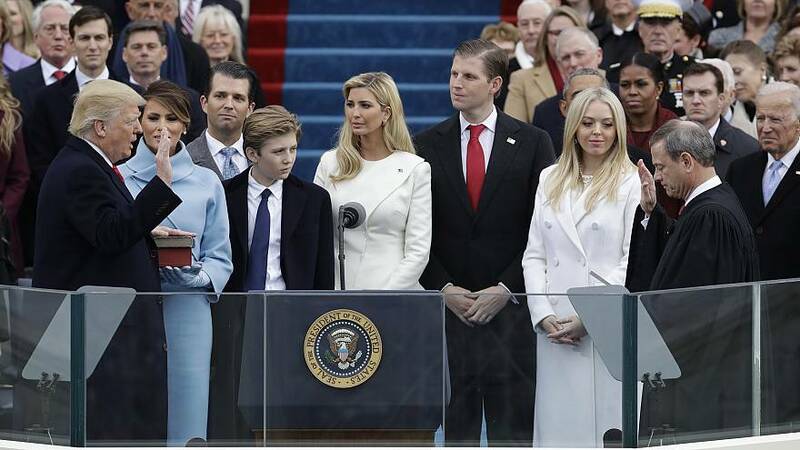 Donald Trump was sworn in as the 45th president of the United States on Jan. 20, outlining his vision of a new national populism and reiterating the same "America First" mantra that delivered the White House to him during the 2016 election. In his first address as leader of the free world, Trump said his inauguration would signify a historic moment when "the forgotten men and women of our country will be forgotten no longer." After months on the campaign trail marked by partisan division and deep skepticism from his critics, Trump told thousands in the nation's capital that his agenda was for every American — even as protesters demonstrated against him elsewhere in Washington, D.C., including some who clashed with police hours later. The next day, half a million marchers demonstrated for gender equality and against the new president during the Women's March on Washington, brandishing pink hats and homemade signs in the streets near the National Mall. More than five months later, Mueller's office indicted President Donald Trump's former campaign manager, Paul Manafort, and his longtime business associate Rick Gates on 12 charges, including money laundering, being an unregistered foreign agent and seven counts of failure to file reports of foreign bank and financial accounts. The special counsel's office also announced that day that it had struck a cooperation agreement with former Trump adviser George Papadopoulos, who secretly pleaded guilty to lying to federal agents about his contacts with Kremlin-connected Russians. In early December, former National Security Adviser Michael Flynn pleaded guilty in federal court to making false statements to the FBI about his contacts with Russia, and agreed to cooperate with Mueller's probe. The special counsel's investigation is still ongoing. Kim Im Ryong, North Korea's ambassador to the United Nations, bluntly warned that the Trump administration's tough talk was creating "a dangerous situation in which thermonuclear war may break out at any moment." The situation has become so dire that Secretary of State Rex Tillerson asked China — Pyongyang's neighbor and most powerful ally — to "use their influence to convince or compel North Korea to rethink its strategic calculus." The regime's actions has led Trump and his administration to ratchet up the rhetoric, with the president in August promising "fire and fury like the world has never seen" if North Korea continues to threaten the U.S. Trump also disparaged the North Korean leader as a "rocket man" during his first address to the United Nations. Later that month, after a tweet from actress Alyssa Milano, who was one of Weinstein's accusers, social media was inundated with personal stories of being the victims of sexual harassment or assault, all using the hashtag #MeToo. Weinstein's downfall has seemingly emboldened others to come forward with allegations of sexual misconduct against prominent men. In recent months alone, at least 30 powerful men in entertainment, business, politics and the news media have been publicly condemned for their alleged sexual misconduct and many have lost their jobs as a result, including Weinstein. "The Silence Breakers" of the #MeToo movement, who gave a voice to sexual assault and harassment survivors, have since been named Time magazine's 2017 Person of the Year. The gunman, Devin Kelley, fired the first shots outside of the church before unleashing more bullets inside the church. His victims' ages ranged from 5 to 72 years old, police said. Kelley was later found dead inside his vehicle after a Good Samaritan stepped in. Vehicular and suicide terrorist attacks hit some of Europe's most popular tourist destinations, as well as the America's most populous city this year. In late March, three people were killed and about 40 were injured when an attacker rammed into pedestrians on London's Westminster Bridge and attempted to enter Parliament wielding a knife. About two weeks later, an attacker killed four and injured 15 after intentionally driving into a department store in Stockholm, Sweden. In May, children were among the 22 killed in a suicide bombing after an Ariana Grande concert at Britain's Manchester Area. It was the deadliest terrorist attack in Britain since 2005. Almost two weeks later, seven people died and nearly 50 were injured when a vehicle rammed into pedestrians on London Bridge, and three attackers embarked on a stabbing spree at nearby Borough Market. During August, 13 people were killed and more than 100 were wounded in Spain when a van plowed into Barcelona's La Rambla tourist destination, before another car hit several people and killed one woman in a resort further down the Spanish coast. In August, President Trump declared America's opioid epidemic a national emergency two days after vowing the U.S. would "win" the fight against it. The White House Council of Economic Advisers recently reported that the epidemic's true cost in 2015 was $504 billion — more than six times the most recent estimate. Maria's aftermath also raised concerns about the relationship between Interior Secretary Ryan Zinke and the small Montana energy firm that was helping Puerto Rico to rebuild its power grid, Whitefish Energy Holdings. Viewers gazed at the eclipse as it carved a narrow "path of totality" from Salem, Oregon, to Charleston, South Carolina. The one rule was to look only through special glasses or projected reflections, but some — including the president — disregarded that sound advice. On Aug. 12, white nationalists gathered in Emancipation Park in Charlottesville, Virginia, before a rally organized by a group known as "Unite the Right." The rally's purpose was to protest the removal of a statue honoring Confederate Gen. Robert E. Lee. Trump denounced the series of events that unfolded in Charlottesville, but was criticized by the public and lawmakers on both sides of the aisle for not fully condemning the protests' white nationalist elements, which included appearances by former Ku Klux Klan Imperial Wizard David Duke and white nationalist leader Richard Spencer. After the fallout, Trump said days later that the NFL should have suspended former San Francisco 49ers quarterback Colin Kaepernick, who was the first to "take a knee" during the National Anthem to protest racial injustice in the U.S.